(Re-)sizing up Yasiel Puig with the Dodgers. We can see now why the Dodgers gave Yasiel Puig all that money. We can also see why they won’t say where Puig will begin the season. 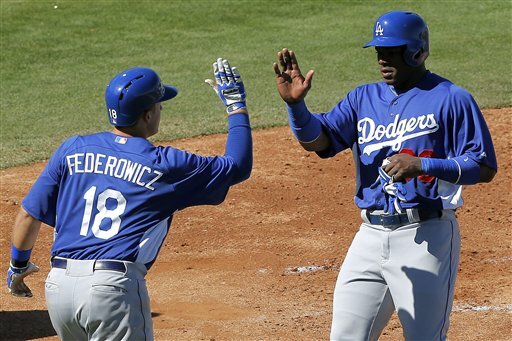 It’s only spring training, but Puig is the only Dodger to have played the maximum nine games. His .421 average (8-for-19) was 10th, and his 1.137 OPS ranked 13th, among all National League hitters when the day began. Only Luis Cruz (with 16) has more total bases than Puig’s 14. Only Cruz and Alex Castellanos have as many as Puig’s five RBIs. But if not Los Angeles, where will Puig be? General manager Ned Colletti had a chance to answer the question Sunday and demurred. Clearly, the jury is still out. A home run against Fernando Nieve, who spent all of last season in Triple-A. A few months ago, Double-A Chattanooga seemed like Puig’s logical opening-day destination. Based on hitting ability alone, Puig looks closer to the majors than Double-A. Maybe the best reason to send Puig to Chattanooga is that it isn’t the Triple-A Pacific Coast League with its high-altitude ballparks, inflated batting averages and unrealistic expectations for what it takes to hit a home run in the majors. Puig gives the Dodgers a big (245-pound) reason for installing a humidor at Isotopes Park, which they hope will create a more Dodger Stadium-like atmosphere. But suddenly it doesn’t seem impossible that Puig could be the 25th man on the Dodgers’ 25-man roster come Opening Day. If hitting were the only factor the Dodgers were evaluating him on, you might like Puig’s chances of sticking around. But hitting isn’t everything and Puig still has to show that he can run the bases intelligently. He still needs to show that he can hit better major-league pitching than Kevin Jepsen and Oliver Perez. This entry was posted in JP on the Dodgers, On The Farm by J.P. Hoornstra. Bookmark the permalink.